To pretend as though the events of recent days are extraordinary is to ignore the context that led to this ‘flare-up’ and is disrespectful to the millions of Palestinians who wrestle with the occupation every day, in both the West Bank and in Gaza. It’s Wednesday. The death toll in Gaza is in the dozens and rising as Layla*, a Christian Palestinian, gets into my car. We live in Bethelehem. 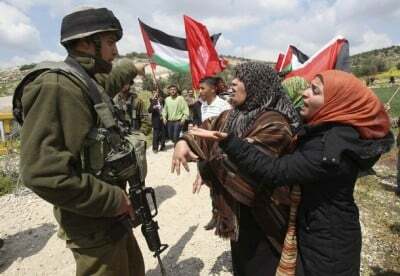 She needs a ride to pick up her tasrich (permit) from the Civil Administration’s office in Gush Etzion, where Israel and the Western media claim that the current “flare-up” began. Layla laughs at our clothes as she opens the passenger door. With her sleeveless top and above-the-knee skirt, she says, she looks like a settler. I’m in long sleeves and jeans, which Layla calls “Abu Dis style,” referring to the conservative Muslim village where I teach. Although we joke about our clothes, I wonder if they reflect the increased tension of recent days; I wonder if they reflect the anxieties neither of us want to admit to. We leave Bethlehem and merge onto a road that’s shared by army jeeps, Palestinians, and Jewish Israeli civilians and settlers. Layla sighs, “I don’t know who to be afraid of anymore, Mya,” she says. We reason that being together keeps us safe from everyone. No matter who might stop us, we’ll be able to reason with them in their own language. Both our clothes and words will be familiar. But, as we drive deeper into Gush Etzion, we quickly notice how “normal” things are in the West Bank. “Look at all the settlers,” Layla exclaims, tapping on the window as we pass them. Even though it’s midday, even though it’s blisteringly hot, even though three Israeli boys were murdered not far from here, even though Mohammed Abu Khdeir was brutally murdered by Jews, even though settlements are illegal, even though Israel is pummeling Gaza, there they are. Settlers. Waiting for buses. Hitchhiking. A lone soldier crosses the road in front of us. “Oh, isn’t he afraid?” Layla asks, sarcastically. “Look,” Layla says again, pointing at an Israeli woman standing by the side of the road in a skirt, her head wrapped in a scarf. “They’re everywhere.” Layla’s voice is indignant, conflicted. Indignant that the media has made it seem as though Jews aren’t safe; conflicted that they are. “Aadi,” normal, I say in Arabic. That’s what this so-called “flare-up” is. More of the same. Yes, there is obviously a surge in the pace of violence and death and destruction and arrests since Israeli officials decided to shamelessly lie to the public and exploit the tragic death of three Jewish boys so they could embark on a campaign against Hamas. Yes, events are happening closer together than they usually do; yes, the timeline is sped up. But violence and death and destruction and arrests are the norm under Israeli occupation. And to pretend as though the events that have occurred in recent days are extraordinary is to ignore the context that led to this “flare-up” and is disrespectful to the millions of Palestinians who wrestle with the occupation every day. Yes, recent weeks have seen mass arrests in the West Bank, but ask my students—many of whom have family members in Israeli jails—if arbitrary imprisonment is normal or not. Ask my quiet, pious, straight-A student whose beloved brother was taken from her for over a year on trumped up charges of stone throwing. Or young West Bankers might talk to you about Samer Issawi, who was held in administrative detention without charge for 17 months. Or ask the more than 5,000 Palestinian prisoners who are currently being held in Israeli jails, many on administrative detention. Or ask the estimated 700,000 who have been imprisoned since the occupation began in 1967. Ask young West Bankers when this “flare-up” began and they likely won’t date it to the murders of the three Israeli boys. No, maybe they would point to May, when 17-year-old Nadeem Nowarah and another protester, 16-year-old Mohammad Odeh, were shot to death by Israeli soldiers during a demonstration. Or pick any other number of Palestinian children who have been killed by the Israeli army recently as your starting point. Like 14-year-old Yusef a-Shawamreh. Or we could date the beginning of this “flare-up” back to December 2013, when 15-year-old Wajih al-Ramahi was shot in the back by Israeli forces. Or, rather than starting with the kidnapping of the three Jewish boys, why not begin the timeline with the kidnappings of Palestinian children from their beds by Israeli soldiers? 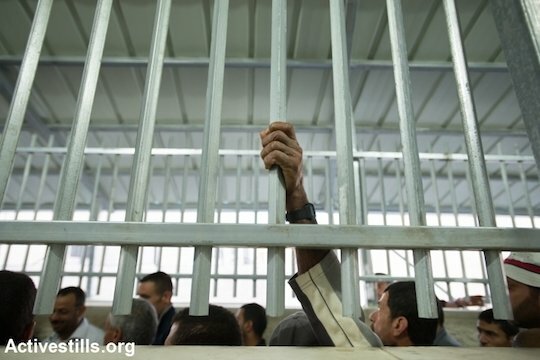 Citing a report by the non-governmental organization Defence for Children International, Al Jazeera states: “In the past 11 years, DCI estimates that around 7,500 children, some as young as 12, have been detained, interrogated and imprisoned” in Israeli military detention. “This is about 500-700 children per year, or nearly two children every day. As for Israel’s unrelenting bombings of Gaza, as for the loss of civilian life there, we should also remember that this, too, is normal—Palestinians who live in the Gaza Strip die on a regular basis. What we see in recent days is an acceleration in the deaths that are part of life in Gaza. And just as innocent civilians have been killed during this “flare-up,” so have they been killed in times when the international media has been paying less attention. There’s also the Israeli blockade, which visits violence upon the people of Gaza by crushing their economy, devastating healthcare, and curtailing educational opportunities. To name a few. The blockade is also a psychological and social battering of Gaza. Its disastrous effects cannot be overstated. One afternoon, we were talking to a gathering of middle-aged men… I asked them if they thought the war, or whatever one calls this, would go on long. “Who cares?” answered Abu Ahmed, 46, an out-of-work construction worker. I asked what he meant. “We lived in hell before, we will live in hell again,” he said. In the West Bank there are insidious forms of everyday violence. Things that, on the surface, might not look like violence. Like getting a permit. Layla and I arrive at the Civil Administration’s Bethlehem area office. She enters her identity number into a machine, which spits out a slip of paper. She approaches an entryway that is blocked—floor to ceiling—by a barred turnstile. On the other side, a soldier sits in a booth behind a thick, glass window. The message of the architecture is: the soldier’s life is valuable and he must be protected from the dangerous savages. The architecture itself is accusatory, condemning, and violent. “Excuse me, I’m here to get a permit,” Layla says politely, in English, through the bars. “Ma?” What? The soldier shouts, in Hebrew, through the intercom. Layla doesn’t speak Hebrew. He unlocks the turnstile and Layla enters and passes through a metal detector. She disappears into the building. He heads to the turnstile and waits to be let through. “No, no, sit,” the soldier barks in Arabic. The man returns to his seat. Only to be told to come again. Only to be sent back to his chair. It seems like the soldier is playing with the man. Once she’s inside, Layla discovers that the computer “isn’t working” on Wednesday. She won’t be able to get her permit. We leave, making the 20 minute drive back to Bethlehem, only to turn around on Thursday afternoon—when the death count in Gaza is even higher—to make the drive back to Gush Etzion again. This time, Layla has brought lollipops to lighten the mood. She offers me a cherry Chupa Chup and unwraps the strawberry one for herself. There are more people in the waiting room then the previous day. Today, it’s mostly women, including a young mother with a tiny newborn, a baby girl. The young mother and the women are waiting to be interrogated by the mukhabarat. They’ve been waiting for a while when we arrive and they’ll still be there when Layla and I leave an hour and 40 minutes later with the permit she shouldn’t need—part of her family was from Jaffa. They were on the land before the state was. Now, they’re refugees. And when Layla and I went back to Jaffa a few months ago to look for the house, she couldn’t even find it. The women sit and wait as the soldier on the other side of the bars calls out random names—names of people who aren’t there. It seems like he’s calling out every name but theirs. It’s Ramadan and it’s hot and the women are fasting. Their faces are tired. They move and sit by the open door, the one source of fresh air in the room. There is a sign on the wall opposite the women that reads “Drinking Water” in Arabic. But the water fountain is unplugged and dusty. And they sit and they wait as the soldier shouts, “Amal? Amal?” through the intercom. I wonder if the soldier knows that this name means hope. Layla and I leave. On the way to the car, she tells me she met Palestinians inside who were also there on Wednesday for hours waiting to get permits for medical reasons. They were told to return Thursday and waited for hours again. The time that people spend waiting: for permits, at checkpoints, driving circuitous routes to reach places that before the occupation and before the separation barrier took them half the time. I can’t count the times that Bethlehemites have told me that they miss going to Ramallah to meet friends for coffee. How it used to be a short trip, how it used to be possible. “Now,” they say. “It takes an hour and a half just to get there.” How these relationships have been lost or weakened as a result. This is the normal, everyday violence of the occupation. This is what the Israelis don’t want you to think about when they start their timeline of this “flare-up” with the kidnapping and murder of the three boys. Mya Guarnieri is a Jerusalem-based journalist and writer whose work has appeared in dozens of publications including The New York Times, The Guardian, Foreign Policy, Slate, Counter Punch, The Boston Review, and Caravan. She was a stringer for The National and Al Jazeera English and has been invited to serve as a commentator on Israel/Palestine on the BBC and Al Jazeera, among others.